I'm currently still in: [WOLF] Team Wolfpack. Since the group falls apart, I decided to look for another clan as well. I'm Jerkchicken aka Quincy 18y old. I'm from the Netherlands. I have been playing for 3 years now WOWS. - Active players: Divisions and CB. I want to improve my stats to +/- 60% WR. Were I'm striving to right now aswell. - Communication: mainly Discord but TS is fine. - Playing CB -> I have the STALINGRAD. - Speaking English & Dutch. If I have forgotten to mention something, please do not hesitate to respond. Hey bud as you know I sent you a PM; we'll talk more on Discord. 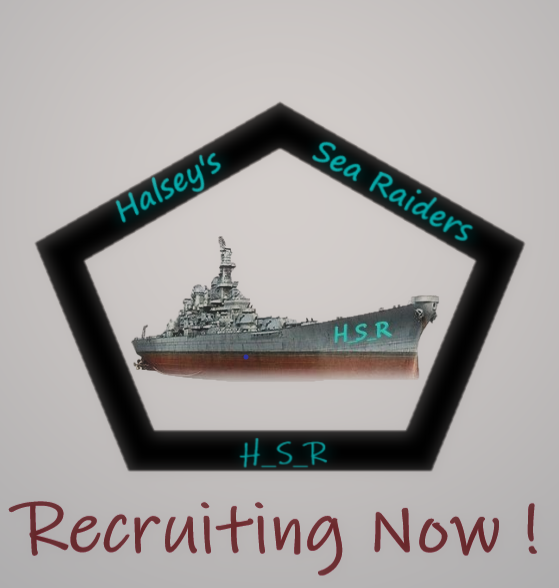 Halsey's Sea Raiders are currently recruiting, if you are interested. We are a new clan, and accept players of any ability. Most of our battles are in division, although we will be looking at CB's in the near future. If you think this team is for you, please let me know or send an invite to the clan. We are looking for active new members who want to be part of our community and who'll join in, we run divisions daily, there is always someone to keep you company, we like to help our members with operations too - but we're also a group of more mature players, so we know family and work sometimes get in the way of gaming. Hi we are looking for active players. that we can talk and play a few games, and see if how fits. So i decised to join PRIDE. Sorry about that i had many choices and I really want to improve stats & play CB aswell. And I know that I could do that with many you guys to!